"My lord of Lannister!” he called out. "I would be pleased to entertain you while you eat. Let me sing you the lay of your father's great victory at King's Landing!" Within their castles, the lords and ladies of the Seven Kingdoms plot to seize the Iron Throne. Their knights train by day and sharpen their blades at night. Bannermen arrive and add their banners to all the others. The armies grow. War is coming. 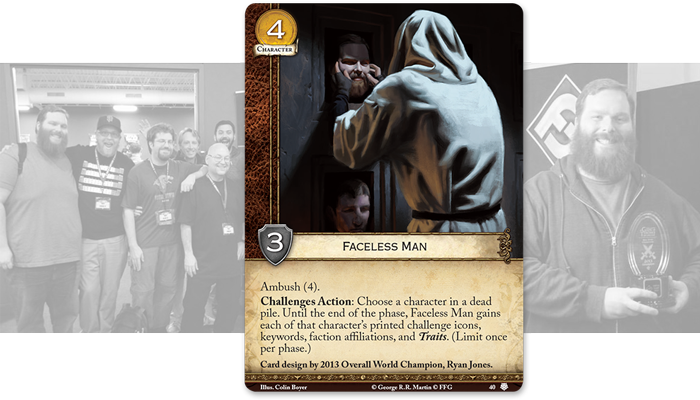 The 2018 A Game of Thrones: The Card Game World Championships take place this November 1 – 4 at the Fantasy Flight Games Center in Roseville, MN! 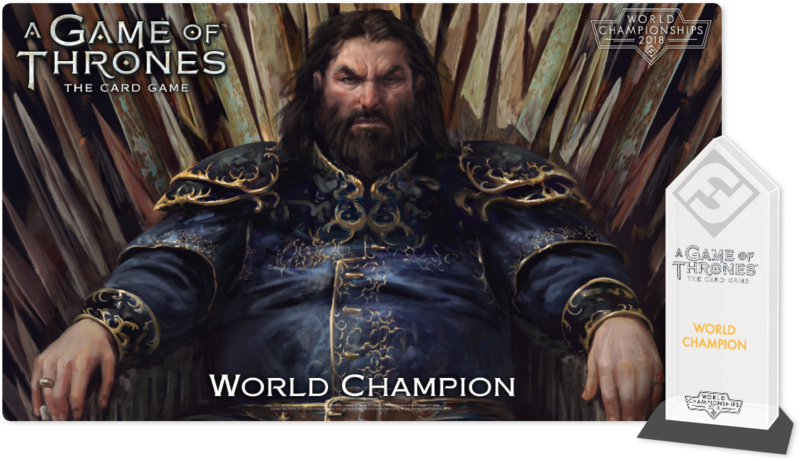 A battleground like no other, the World Championships are the pinnacle of A Game of Thrones: The Card Game Organized Play. Lords and ladies from all the Great Houses—and from all across the world—will stake their claim for King's Landing and the Iron Throne. There will be blood. We will see knights struck from their mounts. Ladies poisoned by faceless assassins. Lords forced low when their coffers run dry. In addition, to all the other prizes at stake over the course of the 2018 World Championship, the World Champion will claim The Greatest Prize in Gaming—the chance to work with the game's developers to inspire the design of a future card! 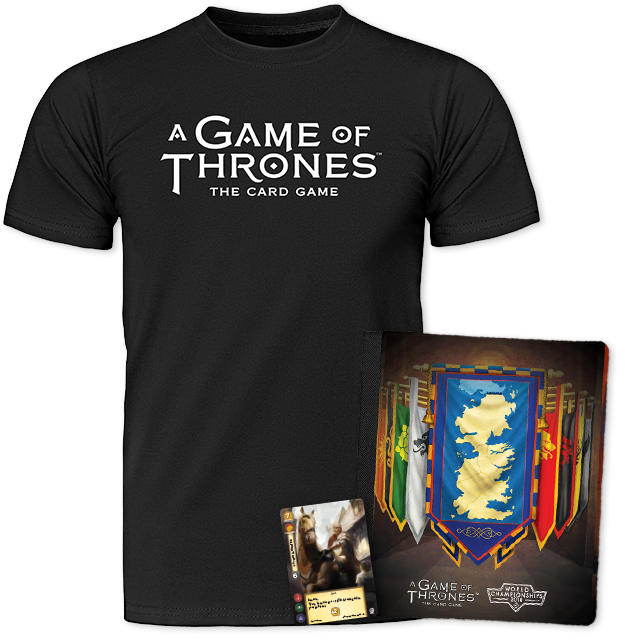 Each player who enters the battles of the 2018 World Championships will claim a participation prize package: one commemorative T-shirt, an extended art copy of Tywin Lannister, and a four-pocket card binder. 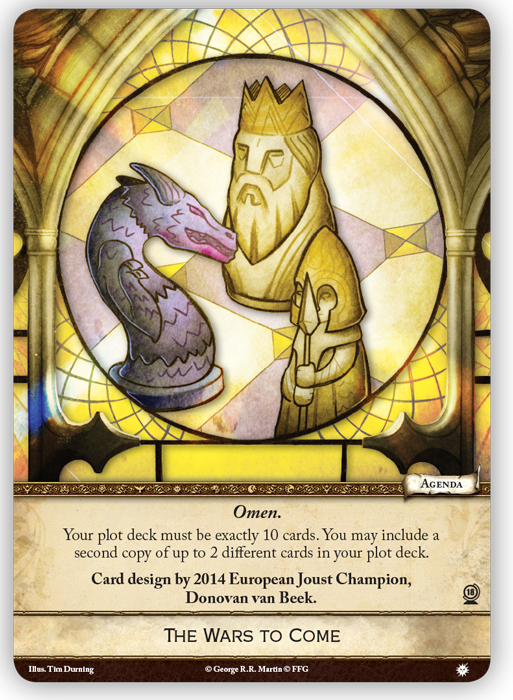 The Great Houses rely upon their banners to support them in their battles, and if you place among the Top 8 players in your faction on either Day 1 (Day 1A and Day 1B) your service will be rewarded with three copies of one card from your faction, featuring spot-gloss and an exclusive Tourney of the Hand frame. These cards will also be made available on the event's prize wall, so every spy, ally of convenience, and captive ward will also have a chance to claim your House's card. And then players will be able to make use of them in their future battles with a frosted plastic version of The Wars to Come, which is also being added to the prize wall. 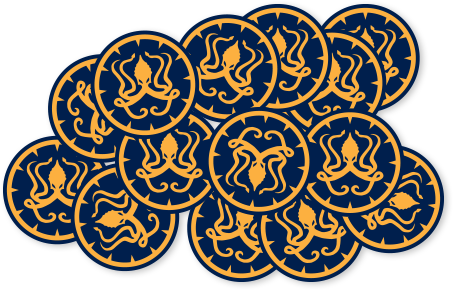 The Top 32 players from each Day 1 (Day 1A and Day 1B) will have paid the iron price for their next prize—a set of fifteen acrylic Greyjoy power tokens. All players who manage to win four or more of their battles on Day 1 will qualify for Day 2. 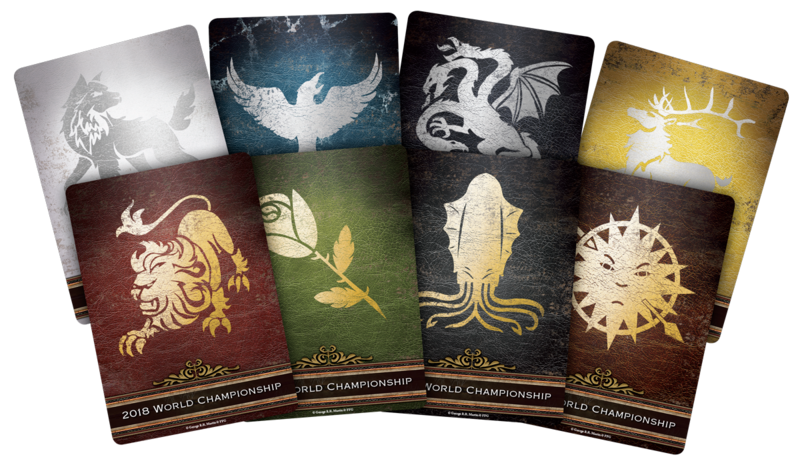 They will also earn a set of House Cards featuring the Tourney of the Hand frame and a metallic ink. The Top 16 players will be encouraged in their final battles by a commemorative medallion, reminding them that all Seven Kingdoms of Westeros must eventually bow to the Iron Throne. 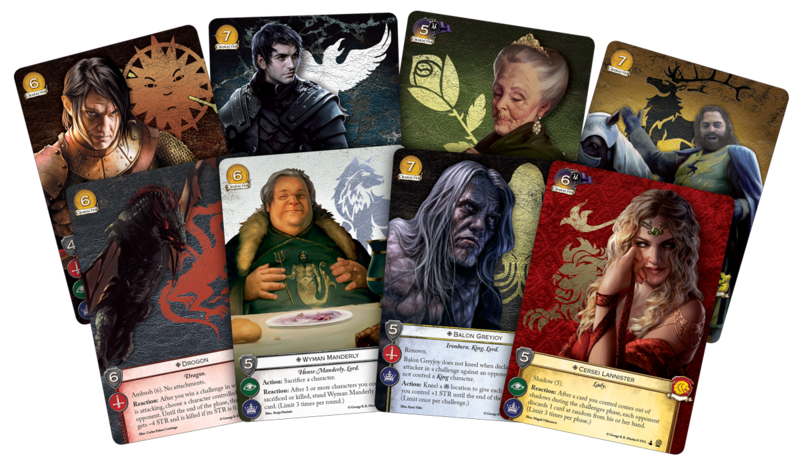 Whether they serve the old gods or the new, the Top 8 players at the 2018 A Game of Thrones: The Card Game World Championships will each find themselves rewarded by the High Septon with a wooden token box boldly emblazoned with the seven-pointed star that represents the Faith of the Seven. 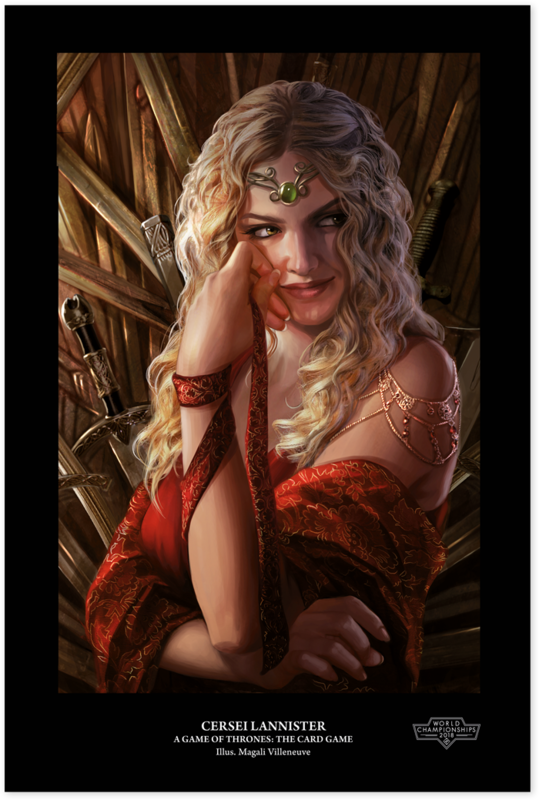 The Top 4 players will have proven themselves among the game's most skillful schemers and will receive a stunning art print of Cersei Lannister with art by Magali Villeneuve. 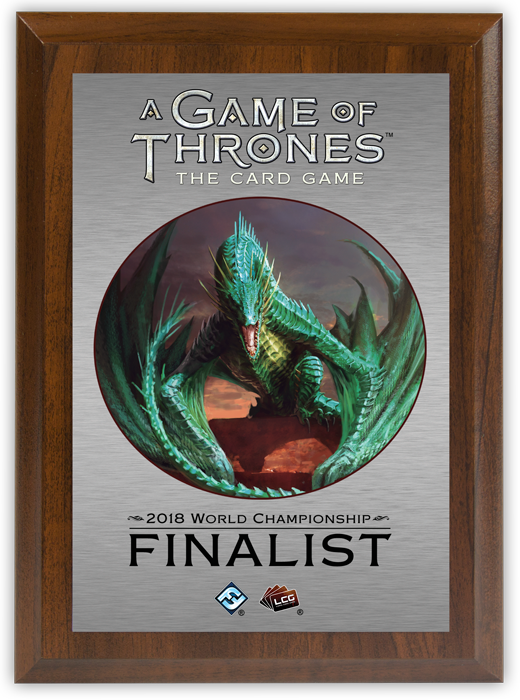 In addition all of his or her other prizes, the 2018 A Game of Thrones: The Card Game Runner-Up will receive a Finalist plaque with an image of the green dragon Rhaegal that's certain to spark an appetite for greater success in the future! 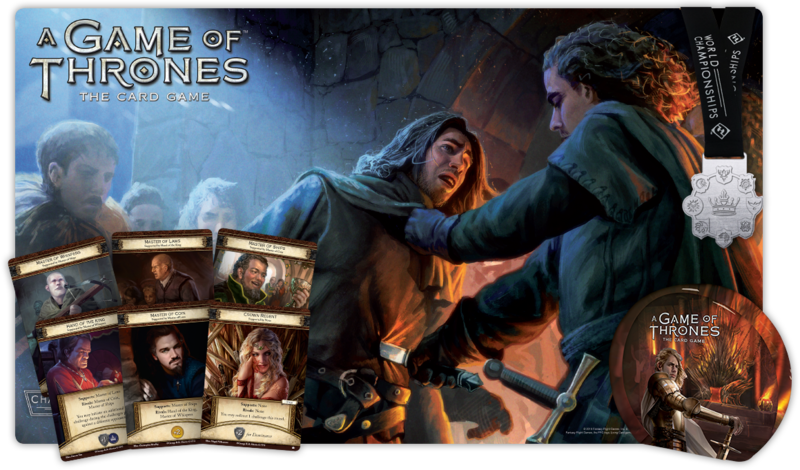 After the screams of battle subside, after the fires die down, and after the victor marches up to the Iron Throne, the 2018 A Game of Thrones: The Card Game World Champion will seize all the privileges accorded him or her. These include an exclusive, one-of-a-kind 2018 World Champion playmat, a stunning 2018 World Champion trophy, flight and lodging to the 2019 World Championships, and The Greatest Prize in Gaming—a chance to work with the game's developers to design a future card! 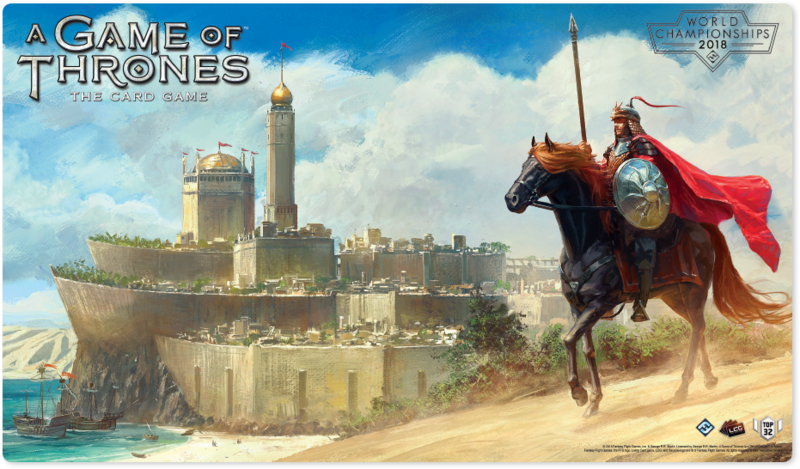 Of course, there's more than one way to play the game of thrones, and some players will seek victory through paths other than the joust's honorable duels. Over the course of the weekend, players will have the chance to enjoy all the multi-faceted alliances and betrayals of the Grand Melee. These players will all receive a complete set of alternate art title cards. The Top 16 will claim a Grand Melee playmat. Each of the players who make the final table and the Top 4 will earn a stunning medallion. The Grand Melee Champion will celebrate his or her victory with a Champion trophy featuring art of Ser Jaime Lannister standing before the Iron Throne. 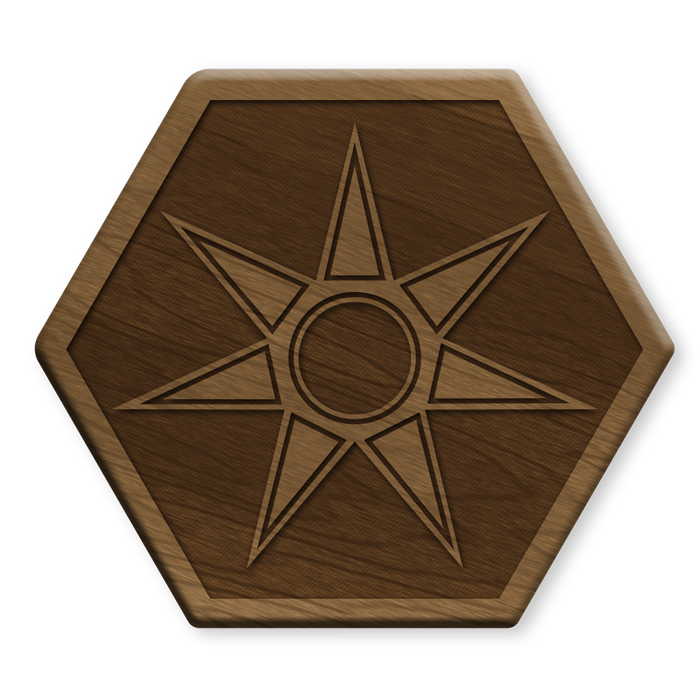 Additionally, World Championship attendees will have the chance to test their skills and strength in the bitter and hard-fought battles of the Kingsmoot. A multiplayer variant that relies upon a unique set of title cards to play quite differently than the Grand Melee, the Kingsmoot comes with its own challenges and prizes. We'll have more information on the format and prizes in a forthcoming article. King Robert Baratheon is dead, and the fate of the Seven Kingdoms are at stake. 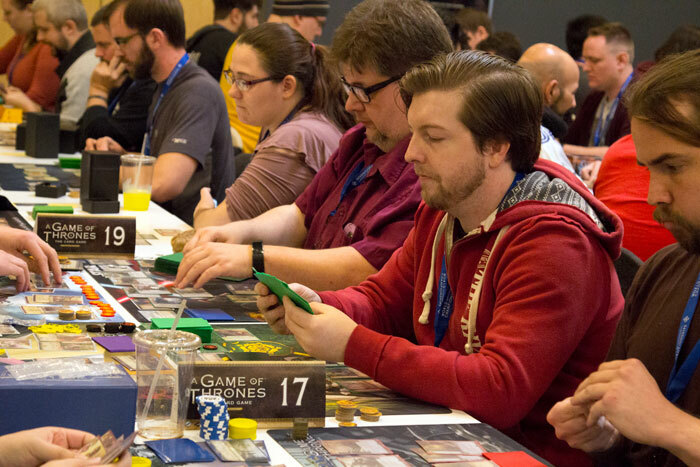 There's everything to play for at the 2018 A Game of Thrones: The Card Game World Championships, and there are still a very limited number of seats available for both Day 1A and Day 1B. Act now to claim your seat—and to trade it in for the Iron Throne! 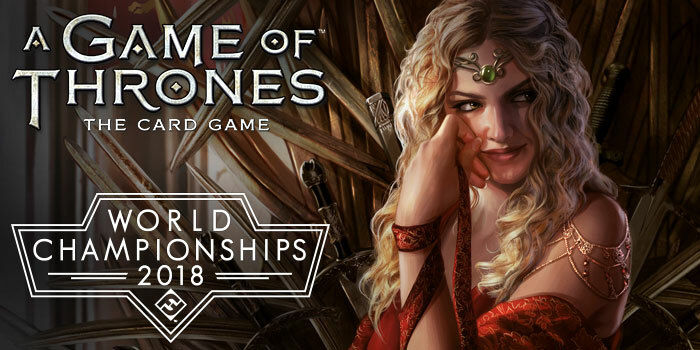 Register now for the 2018 A Game of Thrones: The Card Game World Championships!